Best way to buy RSX type S wheels? Anyone have any suggestions on tracking the SOB's down? I have talked to a few re manufacturing places...sounds about 200$ a wheel. Anyone have any input? 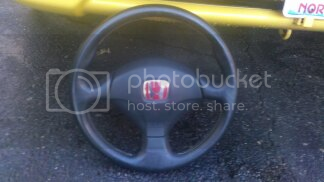 Re: Best way to buy RSX type S wheels? S2000 steering wheels (00-05) Will fit an not throw the SRS light. 06+used a dual stage airbag instead of a single, which is what BB6's use. Here's a set in South Bend, IN. Don't know where you're located but it's the only Type S ones I could find slightly close to my area.